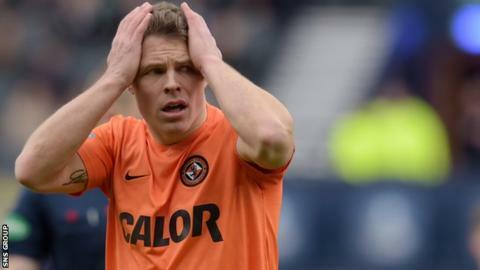 John Rankin says Dundee United need to forget the agony of Scottish Cup semi-final defeat if they are to have a chance of surviving in the Premiership. The midfielder admitted Saturday's penalty shootout loss to Hibernian at Hampden was "a sore one to take". But, with the Tannadice side eight points adrift, he stressed there is "no time to feel sorry for ourselves". "We need to get over it quickly because we have five cup finals before the end of the season," said Rankin. "Is it a big task? Of course it is. We've won six games from 33, now we need to win five from five. "There are 15 points at stake and we have a chance to get out of it." United are at home to Hamilton on Sunday and kick off after 11th-placed Kilmarnock visit Inverness CT.
"We need to be at a high tempo and be ready to attack Hamilton right from the start," said Rankin, 32, who is out of contract in the summer. "Everyone is fighting for their future, whether it's here or somewhere else. We need to pull together with self-pride. "We won't get out of it if we don't approach it that way." Manager Mixu Paatelainen was also left deflated after the Hampden defeat on Saturday, saying his side had wasted "glorious chances" to win the goalless game, having been outplayed in the opening half hour. The Finn is not setting his side any targets, simply focussing on the visit of Hamilton. "We still have a chance," he said. "A slim chance, but a chance. "That's why, inside the camp, you need to be really strong. Everyone has to unite and we need to keep believing. "It will be very difficult, no question. But I believe. I haven't given up and I don't think the players have either."